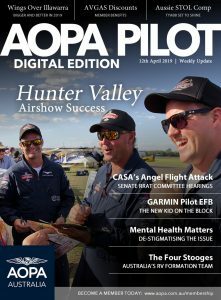 HomeAOPA PILOT AustraliaInnovationThe New App for Aircraft Passengers! There’s no doubt that electronic flight bag (EFB) apps have revolutionised aviation. From general aviation to the airlines, pilots everywhere are using EFB apps for flight planning and navigation. Mobile apps like AvPlan, GARMIN Pilot and OzRunways have all dramatically changed the way we fly. But new mobile technology for aviation isn’t only confined to those in the cockpit. Passengers are now enjoying the benefits of innovative technology to enhance their flying experience. Inflight entertainment is no longer limited to the seat-back screens of large airlines. It now fits in the palm of your hand! Most general aviation pilots enjoy nothing more than flying over the countryside, map in hand, discovering the world from the air. Following your chart “map-to-ground” brings much pleasure as you identify ground features and points of interest. 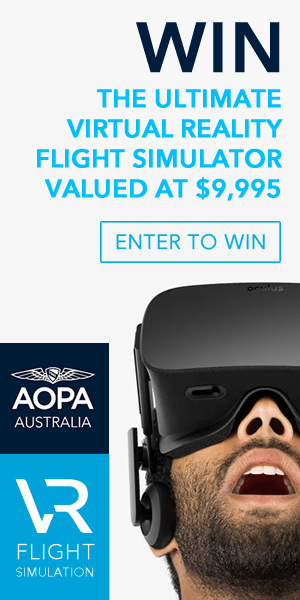 But what about passengers who want to engage more with their flying experience? What options are available to them? 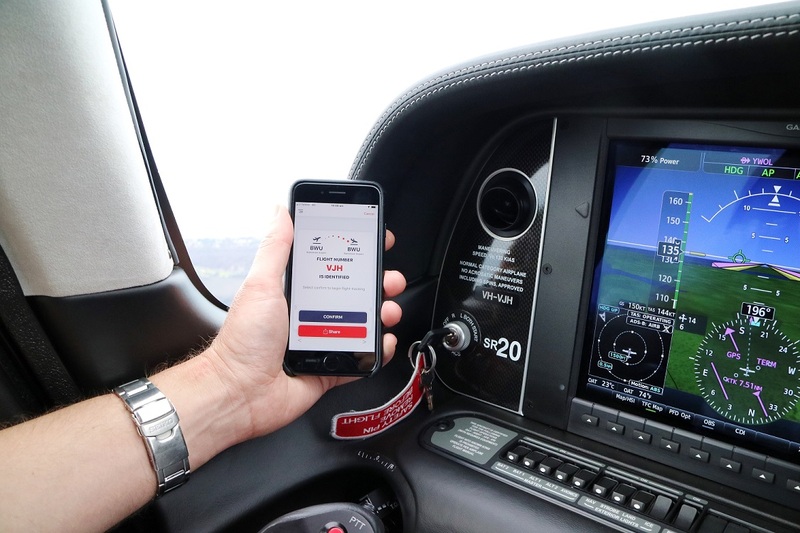 A team of airline and general aviation pilots has developed a new app to help passengers engage more with their flying experience. The app is called Inflighto and it’s basically an EFB designed specifically for passengers to answer the age-old questions; “Where are we?” and “What are we flying over?”. Engineered for use on aircraft with inflight Wi-Fi, Inflighto helps passengers discover the world from the window-seat. It cleverly overlays points of interest, natural events, live weather-radar and live marine-tracking on a highly-detailed moving-map. Inflighto is infinitely better than any airline seat-back moving-map and it’s available for personal mobile devices. CNN has called Inflighto “the airplane app that’s revolutionizing inflight entertainment”. Virgin Australia and Qantas are rapidly rolling-out internet-connected inflight Wi-Fi across their Airbus A380 and Boeing 737 fleets. They are on-track to have 100% of their aircraft fitted with inflight Wi-Fi by end 2020. Qantas offers its internet-connected inflight Wi-Fi free for all passengers but this is limited to domestic aircraft only. Virgin have a slightly different arrangement. They offer a low-bandwidth service free of charge and an upgrade package for passengers who are happy to pay for a faster connection. The good news is that Inflighto works well on both Qantas’ and Virgin’s free platforms. Happy days! The other good news is that Inflighto works equally well in GA aircraft when a mobile data connection is available. 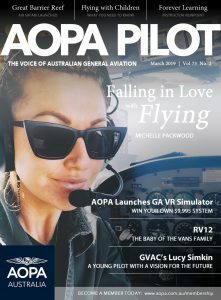 For example, on a recent trip from Bankstown (YSBK) to Canberra (YSCB) at around 5,500ft, a mobile connection (3G) was available most of the way. Our passengers were able to use Inflighto on their mobile devices and they loved it! With Inflighto in their hands, a new world was opened up to them because they knew exactly where they were and what ground features they were flying over. It exponentially improved their flying experience. The Inflighto app works by using aircraft ADSB data, rather than your mobile’s inbuilt GPS, so your GA aircraft will need an ADSB transponder to allow Inflighto to track its location. Airline passengers simply enter their flight number or browse the live flight database to select the flight they’re on – or the flight they wish to track. General aviation passengers, on the other hand, can simply enter their aircraft’s registration instead of a flight number (VH-APP for example). Inflighto then scans all airborne flights, locates your aircraft and begins tracking. If you’ve lodged a flight plan, Inflighto displays your destination and shows your flight-path. Got an ADSB transponder? Enter your VH rego number to track your GA flight. Inflighto is free to download but it offers various paid upgrade options if you want premium features. For example, Inflighto is the only flight-tracking app that also features live marine-vessel tracking. 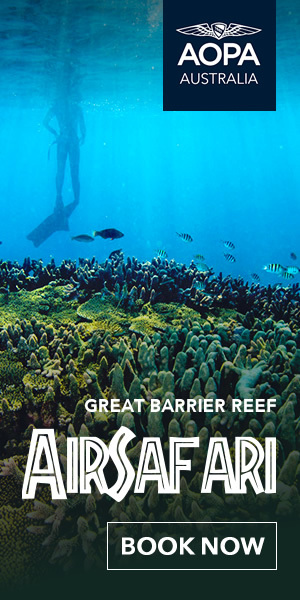 This allows you to see and identify the cruise ships, yachts and pleasure-craft you fly over. 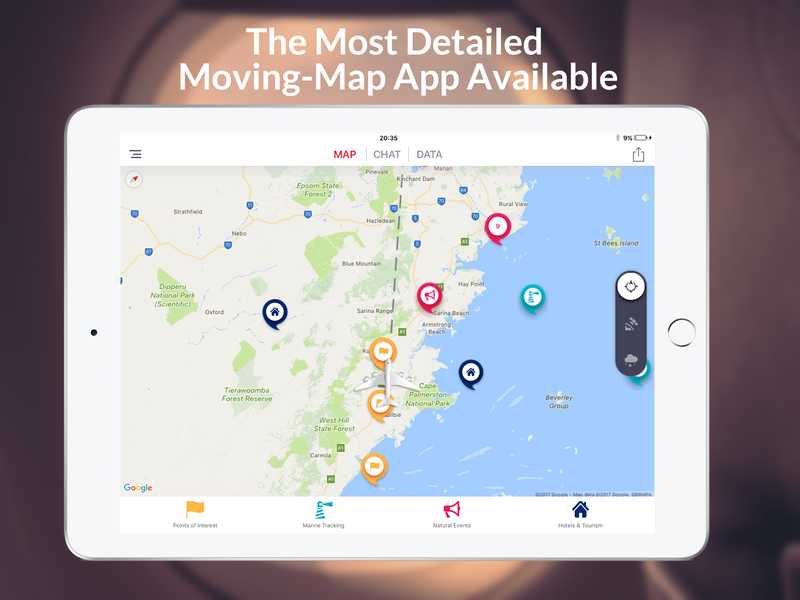 It’s also the only moving-map that features live natural-event tracking so you can identify bushfires, floods and tropical storms – among other things. Inflighto also features live weather-radar and satellite images overlaid on your flight-path. Live flight data is available at the tap of a button so passengers and ‘back-seat pilots’ can see altitude, vertical speed and ground speed. You can download Inflighto for iOS and Android devices. It’s been optimised for both smartphones and tablets and is available on the Apple App Store and Google Play. So before you take to the skies with a plane-load of passengers, make sure they’ve all downloaded Inflighto. It’s best to do this on the ground when connected to a home wireless network to avoid paying for data over mobile networks. 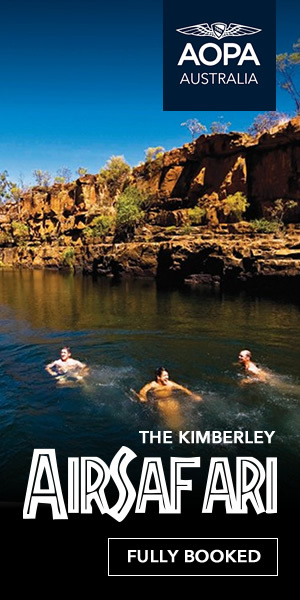 For more information on downloading the Inflighto app go to www.inflighto.com. As all pilots know, the best passengers are happy passengers and we all strive to give our passengers the most enjoyable flights we can. 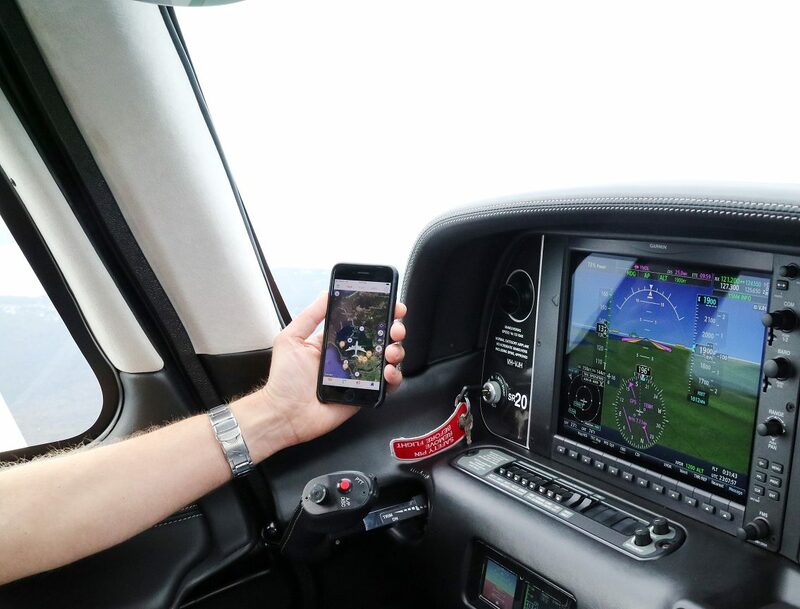 New mobile technology like Inflighto is helping all GA pilots enhance their passengers’ flying experience. Appy flying everyone! Disclaimer: Inflighto is NOT designed to be used by pilots as a navigation aid or for flight-planning purposes. It’s designed for passenger use only. Goodbye Textbooks... Say Hello To Next Generation Flight Training!